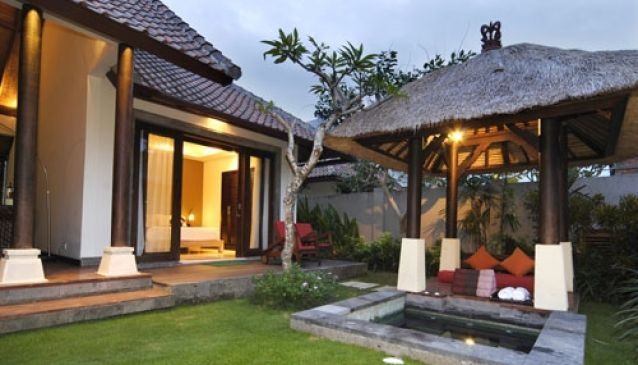 3V Kerobokan Villas & Spa - Vivalavi Family Villas is a family-friendly villa boutique hotel in Kerobokan, on the north end of the Kuta-Seminyak vacation area of #Bali. Kerobokan is arguably as the best venue to unwind with serene surroundings and an array of famous eateries. Accommodation consists of 6 two-bedroom villas, situated five minutes from the dining, shopping, and entertainment life of Seminyak. Vivalavi combines the privacy and tranquillity of a secluded boutique hotel with the convenience and excitement of a vibrant vacation resort. 3V Kerobokan Villas (2 and 3 bedroom) share a 19m x 6.5m salt-water swimming pool, open-air restaurant, fitness centre, spa, golf facilities, games room, boutique-gift shop, Free Wi-Fi . Number of rooms: 12 . Each villa sits on 285 sq.m of tropical gardens and consists of two 25 sq.m air-conditioned bedrooms with bath. 32 cm flat-screen television with 'Astro' satellite, an IDD telephone, wireless internet, and safety box.